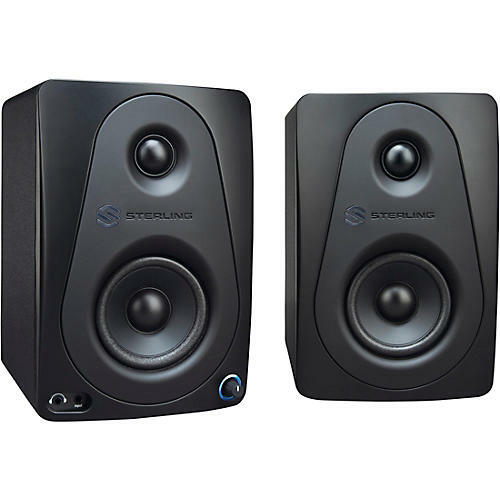 When you need your studio monitors to be as transparent as they are versatile, the Sterling MX3 Black Powered Studio Monitors are the perfect solution. They sound great, have a stylish matte black finish, 3” LF drivers, 3/4” tweeters, front access volume control with dual 3.5 mm outputs and RCA connectivity. The monitors are sold as a pair and are perfect for home studios that need quality sound in a limited space. The front of the monitors boast acoustically engineered 3” low-frequency drivers that offer superior damping. This minimizes any sonic artifacts and unnatural resonance to ensure a clean, natural sound for referencing your mixes. The 3/4” silk-dome high-frequency tweeter and neodymium magnet provide smooth and natural high-frequency response. MX3 monitors deliver 40 Watts of high-efficiency, low-distortion, Class A/B amplification with 55Hz – 22kHz frequency response. The MX3s also feature front-mounted volume control and stereo 3.5 mm inputs and outputs to connect external audio devices for playback or switch to headphones when a quieter environment is required. The MX3 design, like its larger siblings the MX5 and MX8, provides optimal frequency dispersion even when listening off-axis. This means they’ll sound great in imperfect acoustic environments to give you an accurate representation of your mix. Their sophisticated matte black finish and volume control lightpipe make the Sterling MX monitors look as good in your studio as they sound to your ears.